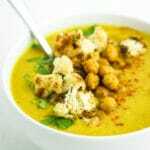 This One Pot Turmeric Cauliflower Soup is a vibrant, nourishing recipe made with warming spices, cauliflower, chickpeas, and coconut milk. It comes together in about 45 minutes for an easy weeknight meal! In a large pot, bring oil to medium heat. Add onion and sauté until translucent – about 8 minutes. Add garlic and sauté 2 minutes until fragrant. Add cauliflower, chickpeas, broth, coconut milk, turmeric, salt, pepper, red pepper flakes, cayenne, and tamari, then stir to combine. Bring to a boil. Once boiling, reduce the heat to low and cover the pot. Simmer for 30-35 minutes, stirring occasionally. Once cauliflower is tender, remove the pot from the heat. At this point, we’ll blend it up! If you have an immersion blender, pulse it in the pot a few times to create the perfect creamy texture. If you’re going the blender route, allow your soup to cool, then add half of the soup to the blender and puree before pouring it back into the pot.